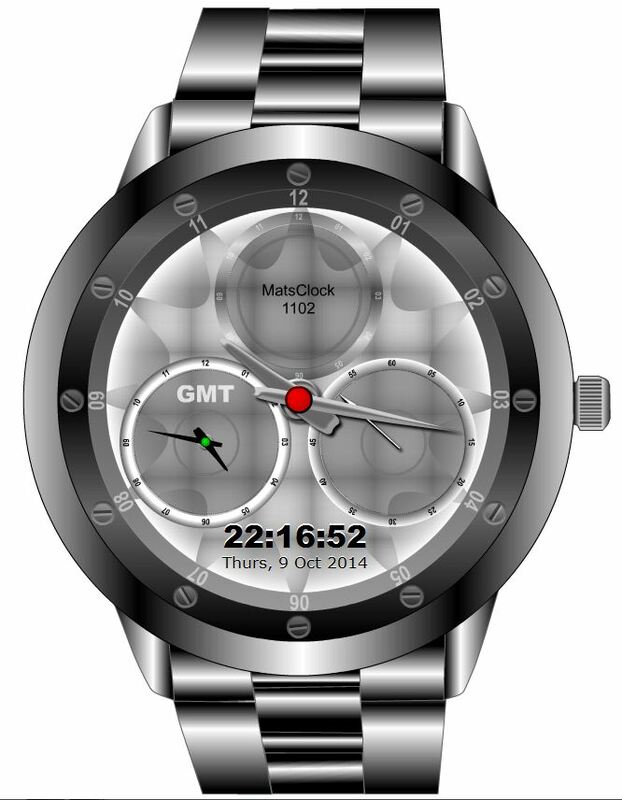 MatsClock-1102 is actually a Wrist Watch that displays both local time and greenwich mean time GMT. I designed this wrist watch in many colors till I finally settled for the grey color. The MatsClock 1102 Wrist watch can actually show you both the local time which you see in the main dial with large hour and minutes needles as well as GMT or Greenwich Mean Time in the smaller dial. I put the seconds needle into the other small dial to reduce the load on the CPU. Weather you are using the local time or UTC (Universal Time Constant) you can use the same seconds needle. As I understand the seconds are the same weather you are using the GMT or Local Time. I have given this wrist watch a fully grey color to resemble graphite or titanium frame and straps. This MatsClock took far too much time to design its straps, the dial background designs, the clock frame, the needles, the smaller dials etc. The red flashing lights in the center of the wrist watch and the center of the GMT dial took some time to come by. I have given Greenwich Mean Time GMT and Local Time with needles. In addition I have also given a digital time display in the bottom on the wrist watch dial in blod and black. You also get a Digital Time Display at the bottom which you cannot miss. The digital time display in the wrist watch is bold, black and beautiful. Overall I am satisfied with looks of MatsClock 1102 which is quite a professional feel. I wish I could manufacture a wrist watch as easy and wear it. You are free to download and use MatsClock 1102 as a Free Flash Clock on your websites and blogs as well as your Powerpoint presentations without any modifications. I have spent countless hours designing my flash clocks and wrist watches which I am giving out free for anyone to use and distribute. You can download all my free flash clock swf files in a single zip file at Download 50 Free Flash Clocks You may continue to visit matsclock.com and you will continue to see more and more new flash clocks and wrist watches being made available for free download.